This demo illustrates the use of bit fields. There is no code for you to write. All you need to do is build and run the project and observe the results. 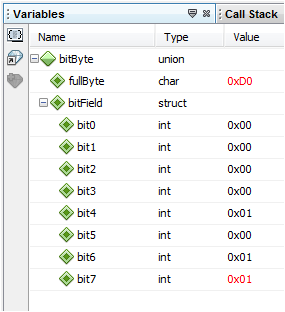 The code itself combines what we learned in Lab 16 about unions, with the concept of bit fields to create a variable that will allow us to access it as a full byte, or as individual bits. Navigate to the folder where you saved the exercise files for this class. Click on the LAB16.X folder. Click on the Debug Project button. This will build and send the program to the simulator. Click on the Continue button to run until the breakpoint. 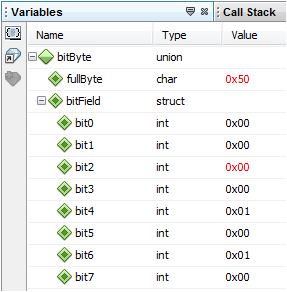 Open the Variables Window ( Alt + shift + 1) and expand bitByte and bitField as shown here. Click the Step Into button to execute line 47. Line 47 writes a value of 0x55 to the fullByte member of the variable bitByte. Note that the bitField members also changed appropriately to reflect the new value of 0x55 = 0b01010101. Line 48 has just been executed, where we wrote a value of 0 to the member bit0 of bitField, which itself is a member of the union bitByte. 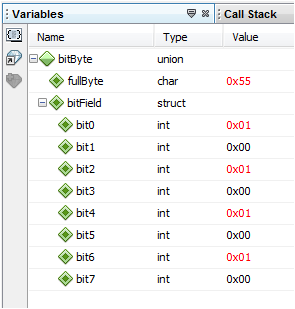 Therefore, when we changed the individual bit, the fullByte member also changed to reflect the new value. Line 49 has just been executed, where we wrote a value of 0 to the member bit2 of bitField, which itself is a member of the union bitByte. Therefore, when we changed the individual bit, the fullByte member also changed to reflect the new value. Line 50 has just been executed, where we wrote a value of 1 to the member bit7 of bitField, which itself is a member of the union bitByte. Therefore, when we changed the individual bit, the fullByte member also changed to reflect the new value. End the Simulation Session by clicking the Finish Debugger Session button. Bit fields allow us to efficiently use individual bits for Boolean values or as flags/semaphores. On the various PIC architectures, setting and clearing a bit field variable in C will make use of the very efficient bit set and bit clear instructions in assembly language. However, other operations may generate more code than would be necessary if you were working with a full 16-bit integer type variable. So, bit fields can be invaluable in some circumstances, but they should be used with care so that excess code will not be generated.